For glueing in a collage, stringing on a necklace, for counting, etc. 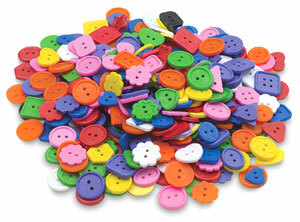 Plastic button assortment in all bright colors, shapes, and sizes (-3/4" to 1-1/2"). Box contains 300 to 400 buttons.